The MMC is working with CILSA's VISTA program to bring you a second immersion over Jan Term break! 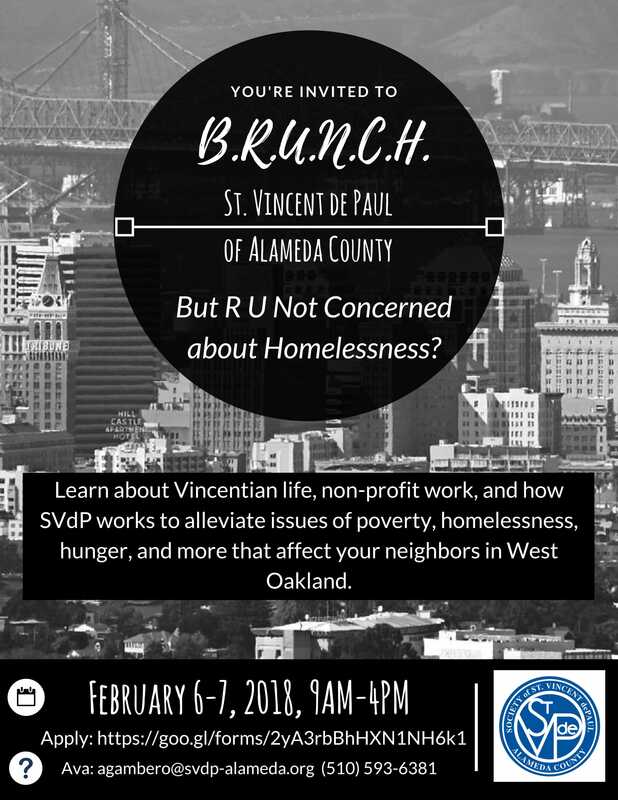 Learn about Vincentian life, non-profit work, and how SVdP works to alleviate issues of poverty, homlessness, hunger, and more that affects your neighbors in West Oakland. It takes place from February 6-7 from 9am-4pm. If you have any questions, or would like to participate, please contact Ava Gambero: (510) 593-6381 or agambero@svdp-alameda.org. St. Vincent de Paul of Alameda County is hosting a two day immersion at our Oakland Direct Service Campus, open to the entire Saint Mary’s community. St. Vincent de Paul hosts hundreds of clients and volunteers per day through our community center, men’s center, women’s center, free dining room, clothing closets, and workforce training program. Participants will gain deeper insight into our nonprofit and our mission, and learn how SVdP works to alleviate issues of poverty, homelessness, and hunger that affect our neighbors in West Oakland. We will do direct service in our dining room, a walking tour of our neighborhood, reflective activities, and more, with the hope that participants leave with a greater concern for the poor and social justice. We will provide a more extensive list to participants fit to the specific immersion. Participants are asked to be modest in their packing; for most trips, only bringing a sleeping bag and pillow, reusable water bottle, closed-toed shoes, jeans, t-shirts, and a sweatshirt, will be more than enough. Last but not least, we ask you to bring an open mind and open heart. There is a $20 deposit for this immersion. We never want anyone deterred from experiencing our immersions because of financial difficulty - this is why the Mission and Ministry subsidizes the cost of all trips. If there are any hardships you may be facing, please come and talk to Yolanda or Nick.